Some universities are creating a new C-level title focused on moving the academy into the digital age. Wearable devices like Google Glass are opening up exciting new possibilities for teaching and learning. Course development at SNHU — the country's fastest growing nonprofit online educator — is a major endeavor. Campus IT departments are looking for candidates with skill sets in mobile, big data and more — but will the best talent be lost to the corporate sector? The IoT will challenge wireless networks with big data, security concerns, bandwidth demands and more. Creating videos to supplement the grading process can help keep learners on track. 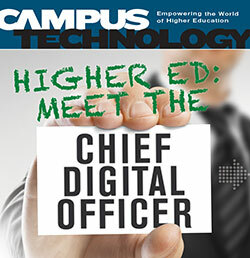 Login / Does Higher Ed Need a Chief Digital Officer?